You probably recall me mentioning Burtons Grill many times. It's a regional chain with 11 restaurants in the following five states: Massachusetts, Connecticut, New Hampshire, Virginia, and South Carolina. They have another Virginia location slated to open this summer, along with locations coming soon to North Carolina and Florida. It's one of our favorite restaurants, so were were thrilled when their Alexandria, VA restaurant opened not too far from us. (Prior to that, we made it a priority to visit a Burtons Grill whenever we happened to be traveling or visiting family in one of their areas!). They have an amazing selection of gluten free menu items, including the best fried calamari ever (and yes, it's gluten free!). They also are extremely knowledgeable about how to safely prepare gluten free meals, as Kevin Harron, the co-founder and president of Burton's Grill, has Celiac disease himself. It's not surprising, then, that they would carry on this mission to serve the gluten free community with their second restaurant concept, launched in 2014. It's called Red Heat Tavern, and the casual dining restaurants, inspired by the food and ambiance of backyard barbecues, are located in both Bedford, MA and Wilmington, MA. The food is infused with smoke flavors from a unique hardwood charcoal-powered josper oven, which can reach 800-1,000 degrees. Take a look at your choices on their menu, and just remember, any items can be prepared gluten free...just talk to the manager upon arriving at the restaurant. In fact, it never hurts to call ahead, although it's not necessary. Their servers, managers, and chef are ready to impress you with their wonderful mouth-watering creations, some of which are shown here! You can learn more about both Burtons Grill and Red Heat Tavern on GlutenFreeTravelSite. 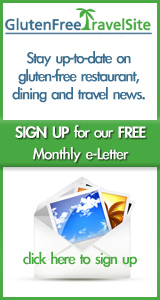 If you've dined at any of their restaurants, be sure to share your feedback by submitting a review to GlutenFreeTravelSite!